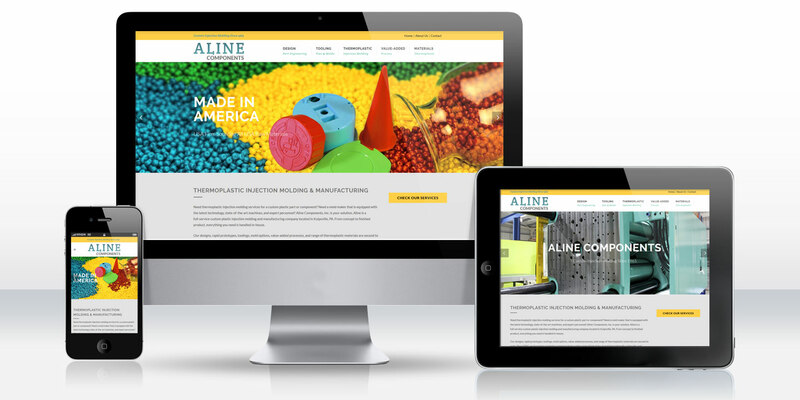 Aline Components revitalizes its online presence with a colorful new responsive website featuring new search engine optimized content all by DDA. Aline Components was a long-time client of DDA's, having first developed a new search engine optimized (SEO) website with the agency about a decade prior. A long-time client under the DDA SureThing search engine marketing program, Aline Components knew first-hand the value of DDA's award-winning SEO services. When DDA informed Aline Components that new Google standards would make the development of mobile-optimized website increasingly important, exactly tracking with the fact that over half of all internet search queries are now done on a mobile device, Aline Components knew that now was the time to update their website with a mobile-ready responsive design featuring totally new graphics and expanded SEO content to preserve and extend their rankings into the future. It was critical that the new website be fully compatible across all major browsers, devices, screen sizes, and operating systems to ensure that no potential customers would be missed. In order to capture an even wider audience of potential customers, the keyword-rich search engine optimized content would be expanded to cover many additional materials with which Aline Components works in the custom injection molding processes that produce custom plastic parts for its clients. Other pages would be used to target more localized traffic. Even more importantly, both DDA and Aline Components felt it was critical that the look and feel of the website be brought up to contemporary standards, replete with high resolution images, bold contrasting colors, improved and more intuitive navigation, and a larger overall emphasis on visual appeal. DDA's professional copywriters began with initial keyword research to determine what subjects would be best to write about for the additional SEO content, with the client providing feedback to narrow down the topics to the materials that represented the best expansion of market opportunity. Once the additional topics were nailed down, the website architecture and navigation were laid out, and the initial design concepts were developed. After a few rounds of client feedback on color scheme, layout, font, and graphics, a final design was arrived at which emphasized bold color contrasts, large high resolution imagery, clear marketing messages, and effortless navigation. The rotating slide imagery emphasized the 50-year history of the company and its all American nature as a USA firm sourcing all USA raw materials for the best in quality. Furthermore, this imagery scrolled at a slower rate than the rest of the page to give a 2.5D website design effect that helps make the visuals more impactful and memorable for the user. The menus give users quick access to understanding everything about the company, from its part engineering, its tooling, the variety of thermoplastic injection molding capabilities it has, the numerous value-added processes it takes in, and the many materials with which it works. The homepage also features a parallax scrolling image about halfway down which gives the site a sense of depth as the user scrolls. The top menu reduces in size as you scroll down, but still stays fixed to the top so that it is always a cinch to move from one page to any other throughout the website at any time. Each specific section was given its own image band to keep visual cohesion throughout each one, all pulling from professional photography DDA took of its facilities years ago when DDA first began working with Aline Components. The content pages were all separated into sections, with clearly visible markers breaking up the texts, helping to sustain interest for the reader throughout and giving emphasis to concluding remarks on each. The new responsive website, with its bold and colorful graphic design, pushes Aline Components into the future, reflecting a company that not only has a depth of experience but a drive for continual innovation and improvement. It's extensive search engine optimized content and well-organized navigational system will help drive traffic to the site and keep it there. Most importantly, the responsive website design will ensure that the website effectively targets all markets looking for their plastic injection molding services by presenting a beautiful, easy-to-navigate website no matter the device and screen size used to access it.